Game of Thrones Episode 8, “No One”: No one is the worst person in Westeros. After each episode in Game of Thrones Season 6, we’ll be answering a crucial question: Who is currently the worst person in Westeros? This week, technology and culture writer Jacob Brogan is joined by Brow Beat intern Darian Alexander. Brogan: Hi, Darian! Thanks for joining me to talk about “No One.” It’s tempting this week to treat that title as a prophecy and suggest that no one was the worst person in Westeros this week, if only because Arya finally rid us of the loathsome Waif. But then I think back on their final showdown, a scene that we were denied in favor of some theatrical face peeling, and I start to get cranky. It’s strange that the episode also refused us the excitement of the Blackfish’s final showdown with Jaime’s men. For a series that should be all about the clink and clash of blades, it’s showing us surprisingly little of the action. I was excited, of course, for Arya’s final declaration, her definitive reclamation of her name and identity. But I’m more curious about the question she asks early on, “What’s west of Westeros?” I know that she’ll be making her way back into the heart of the drama—such as it is—but I wish she could just make out on her own. She’s heading back to a terrible place, full of terrible people. Who among them got your hackles up this week? Alexander: I share your relief that Arya is finally peace-ing the hell out of Braavos and your dissatisfaction for how her showdown with the Waif went down. We sat through countless sequences this season in which the Waif beat the snot out of our favorite Stark; we deserved a bit more proof of her demise than a cut candle and a grisly wall ornament. That said, I momentarily sidestep the purpose of this post to nominate the Waif for “Best Person in Braavos”—for finally dying and thereby pushing Arya ever so slightly toward a family reunion. Farewell, House of Black and White. It’s been real. As to Blackfish’s apparent—but, again, unseen—death by battle, I’m a bit skeptical. With all the buildup over the last few episodes, it seemed like the show had something bigger planned for him. Am I falling prey to wishful thinking? Is Edmure Tully really the best Tully we’ve got left? Sad, if so. And what did you make of Brienne’s wistful wave goodbye to her best bud, Jaime? For a character as sincere as any, it may have been her most understatedly romantic moment yet. Brogan: Much as we’ve all been rooting for the Brienne-Tormund ’ship to come in, it certainly was nice to see her reconnect with Jaime, even if she only did so from the passenger side of the world’s slowest moving rowboat. It’s worth pointing out, though, that that whole sad scene could have been avoided if the Blackfish had just agreed to give up the castle and head off to help his kin. Whether or not we see him again, can we really give him a pass for putting dignity and honor over what’s best for those around him? Alexander: Valid point, and that prideful decision-making may well make the Blackfish our early front-runner for WPiW. But then, as he himself put it, he has as much right to reclaim his home as Sansa has to reclaim hers, no? Besides, I never took Ser Brynden for the go-along-to-get-along type—like a certain shortly-shorn Lannister, he “choose[s] violence.” Which brings me to King’s Landing. What did you make of FrankenMountain’s ​Mortal Kombat–style fatality of that poor, overmatched Faith Militant kid? Hard not to root against team High Sparrow at this point, no matter who it means we’re rooting for in the process. Brogan: That’s among this show’s most devious qualities: We’re backing Cersei and Qyburn’s Monster in part because the people they’re up against feel even worse. But the biggest jerk of the King’s Landing sequences had to be Tommen, who announces that there will be no trial by combat, thereby denying us our long awaited Cleganebowl—the battle between Mountain and Hound. Maybe it’ll still happen, though! You’re a licensed attorney, Darian. If we’re looking forward to a more traditional trial, do you think the mouldering Mountain would be able to perform in a courtroom? Alexander: Good question. Mountain doesn’t do words, let alone “your honor” or any sort of legalese. I suspect that the brothers Clegane would both find themselves in contempt of court in the most imaginatively violent ways possible—ways that would make Col. Nathan Jessup proud. But as fun as that might be to watch, we can’t let little Tommen off the hook. His fidgeting-in-his-throne, glassy-eyed decree was lame and totally anticlimactic. Tommen: I know you’ve got a golden shroud with your name on it (which, you know … sorry, kid! ), but do you have to be such a wuss on your way out? Brogan: Does Tommen really have enough agency to be the worst, though? Is he any more pathetic here than he has always been? I mean, you once compared him to an herb, which seems about right. But even most herbs have more character than Westeros’ boy king. Maybe Tommen’s a bay leaf, subject of a vast conspiracy hiding the fact that no one knows what he actually does. Who’s next on our wheel of worsts? Brogan: There’s a part of me that wants to say it’s Kevan Lannister, a character who shows up briefly, just before Tommen’s announcement in an attempt to stonewall Cersei. Though he’s been around since the first season, I’d basically forgotten who he was. But just look at him: Dressed as he is in all form-fitting black, he looks like a dude who dies when the Death Star blows up. I suspect that’s how he’ll go out when he inevitably does, side effect of explosive conflicts between the real heroes and villains. But then again, is anyone ever really a true hero or a true villain on this show? Captive to his conversation with Jaime, Edmure asks, “How do you tell yourself that you’re decent after everything you’ve done?” It’s a line that could apply to almost any of our Game of Thrones favorites, since virtually everyone—including Dany, who shows up briefly to remind us that she exists—is profoundly compromised. But maybe it applies to the hapless Ed most of all. Is he the worst for giving up Riverrun in order to protect a child he’s never met? Alexander: Our man Kevan is, I agree, another Lannister lemon, his most notable trait being the fact that, in a show full of exotic, colorful names, dude’s name is Kevan. But no, he’s not the worst—too forgettable. There’s a pretty good case to be made for Edmure, who not only handed over his uncle, his castle, and his family honor, but delivered the show’s themes in some incredibly on-the-nose dialogue. And yet, it’s early to say what will ultimately come of his narrowly self-interested choices. We’ve seen time and time again that Westerosi wars unfold in unpredictable ways. So, to keep with the legal theme, I vote we hold any judgment of Edmure’s worstness in abeyance for now. Brogan: Maybe that’s where this show has left us: As the title suggests, no one is the worst person in Westeros after all. Because everyone is terrible. Brogan: Well, we know this much: We love Arya. 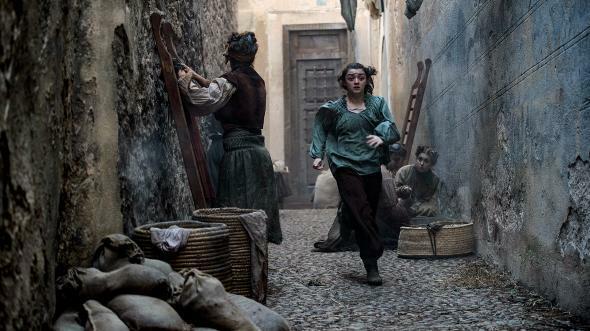 Go west of Westeros, young Arya! May better characters await you.